Click here to sign up for email updates from Barry. I was thrilled to find your website as I’m conducting market research for my business plan to provide local, organic tomatoes year-round from a greenhouse. I believe it’s possible to raise awareness of just how good food can be if we can provide a good supply and get around the seasonal challenge. I live near Atlanta, and various food distributors, including Whole Foods, have told me they offer good tomatoes when they can get them. Their customers are asking for more locally grown foods. I want to solve that problem. 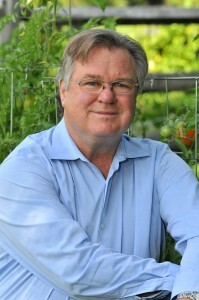 Can you direct me to any valuable market data that would help support the attractiveness of the local, organic tomato market. Everything I’m finding is about the mass-produced conventional tomato industry. I’m looking for data that will attract the investment needed to get production going. I found 100,000 sq ft of greenhouse space available and would like to bring this supply online right in the heart of Jan-March. 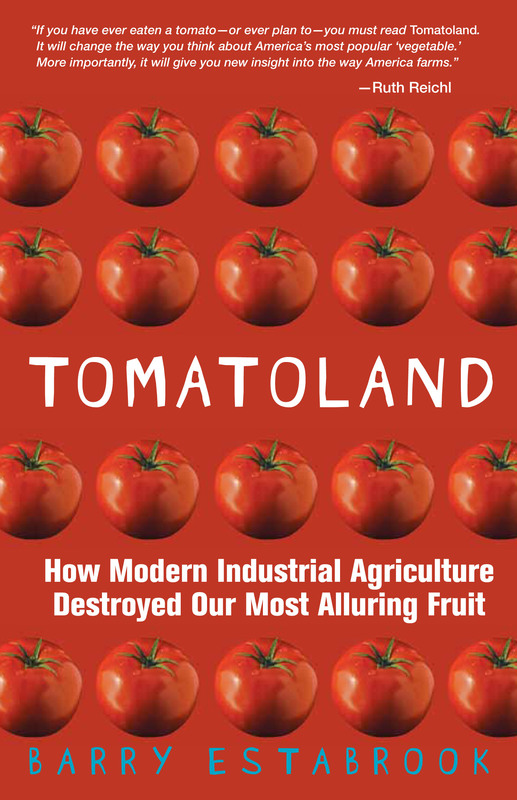 I just finished reading Tomatoland. Actually I bought the ebook version twice, once on my Kindle app, and when that failed I bought it again on my Nook several weeks later, so don’t go patting your back for the sudden surge of sales, it’s the same guy. Wow, thank you for this eye opening book. I live in south Florida, and go to the Redlands on certain weekends to buy from farmers stalls, and I had no idea what was going on down here. It’s important to me for several reasons: after 32 years in the airline industry, and many years since I graduated with a degree in culinary arts, I finally look forward to retirement and…, own and operate my own food truck, and work twice as hard. Is that insane? I care about food. No actually I care about good food, and I try as much as my meager airline salary will allow to eat good food, and nothing is more pleasant in a salad than a good tasting tomato. When my wife and I decided that we would operate a food truck my goal was to make something simple, something tasty, something that says American, and that something was a good hamburger. We did plenty of taste tests with family and friends, and even a few strangers. The grass fed beef, the sweet texture of a toasted potato bread bun, the large cut organic Russet fries, man everyone loved them, but I couldn’t get over the nagging feeling that something was missing, that is until I read your book. A good burger needs a good tomato, and it came to me, all the hundreds, maybe thousands,( who’s counting), of trips to Fudruckers, In-N-Out Burger, Five Guys, Elevation Burger, and all the other run of the mill burger joints in America, and not once, not one time did I ever stop to pay attention to that pretty round and red slice that accompanies this American icon, the Volksfood of the American people. 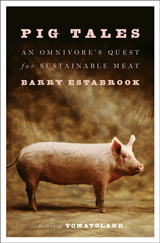 So thank you for a great read, thank you for showing me the darker side of food production. All I can do is promise to shop ethically when I start my business. My name is Wyatt Travis and I attend Winona State University, I was recently at your speaking about your book “Tomatoland,” it was very interesting to hear the author of a book come in and speak about their own experience on writing their book and what they went through writing it. I was really hoping you could help with something. I’m writing a paper about your book and my topic is pesticides and the problems Florida has with them(dangers, regulations, why pesticides are the worst in Florida, and solutions to the pesticide problem), All I am asking is that if you could help me come up with a strong thesis statement about this topic referring to your book. I would greatly appreciate the help of a professional like you. Thank you for taking the time out of your insane schedule you mostly likely have to read this and I hope you can help! Sorry, Wyatt. I have not been very attentive to my blog lately. Hope your project went well. I just saw your piece on MRSA … I’m not sure how this happened but your article is completely wrong. Denmark has one of the highest incidences of MRSA in Europe. Just a few months ago random sampling in Sweden of imported pork from Denmark showed that 1 in 5 packages was contaminated with MRSA. Danish pork products are likely to be banned in Sweden and Norway due to this issue. The government has had to take steps to curb the situation, but they are far form adequate. Here is a link to just one of the many articles that have come out recently. When did you do this research? In the US it is about profit and I am 72 and as far as the meat industry is concerned I and the rest of the populations is collateral damage and you are showing a better way, but the industry in large part is not listening. The bean counters rule. My wife and I try to eat only grass fed chicken, beef and pork as well as organic as well. Not all can afford the added expense though. We live in San Luis Obispo county and this is about as good as it gets for healthy living and locally sourced whatever. The drought is the gorilla in the china shop though. Keep up the good fight. Thank you for your environmental journalism. I listened to your conversation on the Terry Gross show this afternoon and was disgusted to hear your descriptions of the keeping of pigs. I am 76; born in Scotland and brought up in Rhodesia (now Zimbabwe), now living in Oklahoma. When I lived in Rhodesia, our next door neighbor (who had a son my age) was the head of the Conservation Section of the Department of Agriculture of the Rhodesian Government. One of the projects he headed was related to pig breeding and the disposal of the pig manure. The department had developed a process which I think you might find interesting. They had a small pig farm – maybe 100 pigs or so. As far as I can recall (this was in the 1950’s), the pigs were not subjected to any of the treatment you mentioned. They seemed to be able to move around in the pen. The pigs were on the top of a hill and the pig pen had a concrete floor. This floor was hosed every night so the water and the manure flowed into a small lagoon below the pen and from there it flowed out on to the side of the hill. Over time, the manure, because of the consistent nature of the hosing, eventually fertilized the whole of the side of the hill as the water and manure slowly crept down the hill beneath the surface. The hill was home to a huge field of maize (corn) and other crops with which they were experimenting to find which were best suited to the process. At the bottom of the hill, was a concrete fish tank the full length of the pig pen, and about 10 feet wide. In the tank was a variety of local fish. The fish seemed able to live off the manure from the pigs but I’m not sure on that point. The tank was sectioned off and by inserting a two steel walls to permit the catching of some fish. The fish were “caught” when the water was pumped out of that section. That water was then pumped back up to the top of the hill where it was released into the small lagoon below the pig pen so it would be part of the irrigation once more. The steel walls were removed gently and the tank became one big tank again and topped up from water tank there for that purpose. The fish were left to multiply. From this process there were three sources of revenue; the pigs, the crop on the side of the hill and the fish from the tank. In addition there was no need to buy fertilizer since the pig manure provided that. The fish appeared to be in fine fettle and were very popular with the farm staff. Now this was back before Zimbabwe was founded so I doubt if it is still there. The farm was in the Mazoe District some 30 miles north of Harare. Mazoe (now called Mazowe) was an area which produced Citrus fruit and was very productive at that time. Mazoe oranges and grapefruit etc. were exported to Europe. I hope this piece of information will be of use to you. Originally from Columbus, Ohio I’ve lived just outside of Frankfurt, Germany for the past 15 years with my wife, who comes from a small agricultural village two hours north where many families still raise and slaughter their own pigs. Even in the small city (Langen, Hessen) in which we reside, we purchase our meat from a family that still raises and slaughters their own animals for human consumption in a humane manner. While there is a difference in price when compared to the local supermarket chains, it’s not unaffordable and the difference in taste more than justifies the difference in price. In this part of Germany the “Mettbroetchen” is a delicacy. A Mettbroetchen, of course, is a typical roll of white bread topped with raw ground pork and slivers of freshly cut onions. Many of my American friends couldn’t fathom eating raw pork, the thought of which conjurs up one horror story after another with regards to disease, parasites, etc. I guess if your main source of pork is an “industrial factory” detailed in Barry’s book, I can understand. Barry: If you’re ever in Frankfurt (and most people in Germany generally pass through), let me know. I’d love to treat you to a Mettbroetchen. Thanks for great interview. I enjoyed your interview on NPR. You were talking about the pollution caused by massive pig farms, but stopped short of what I think I the obvious answer. They should have to have sewage/waste water systems just like cities and municipalities require. Why doesn’t anyone ever bring up this point? Pig and cow farms produce more waste than many towns, yet aren’t required to have a sewage system. It doesn’t make sense especially when they’re making such large profits. I raise grained, pastured, humanely-treated, hormone-free happy hogs in southern Vermont and sell whole and half hogs by advance-order CSA. Glad to have you visit if you’re in the neighborhood. Thanks for your great work regarding the pork industry. I had the misfortune of living three miles from a swine CAFO in southeast Nebraska. If you would like to know any facts about the collateral damage these things inflict upon their neighbors, I could tell you all about it. medical field, it was an easy to understand the whole superbug cycle. you again. I have joined your fan club!